and maybe... a bit of drama. 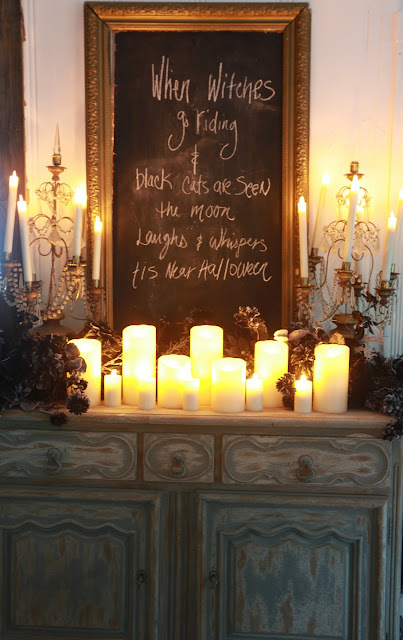 It is no secret that I am not a huge Halloween decorating kind of girl. 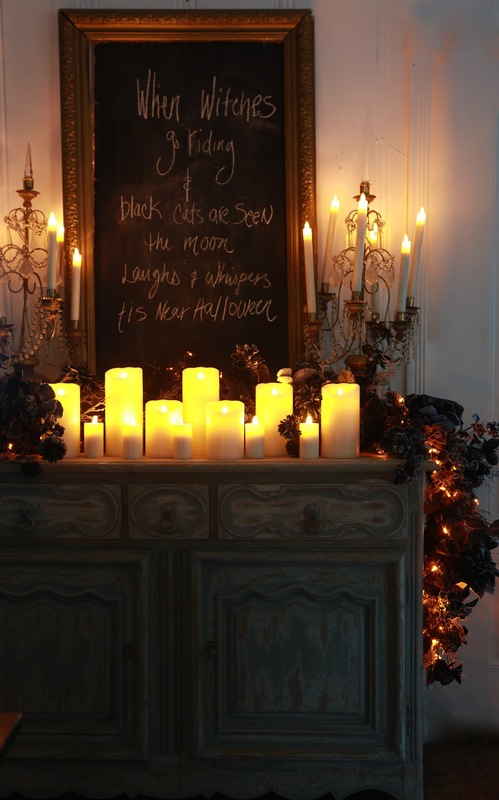 But when I do decorate for Halloween- I tend to lean on the 'elegant' and romantic side. 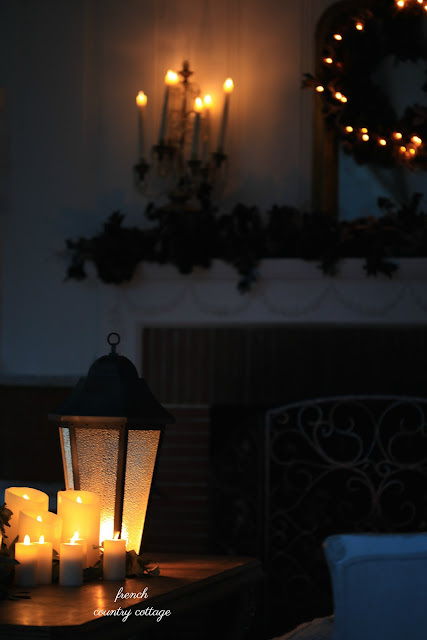 Basically, it is all about the ambiance over here. You see... it started with those candles. without any of the worry. I am more than mildly obsessed with them. and have special technology that makes them flicker like the Haunted Mansion at Disneyland. you name it- all with the flick of a switch on the remote control. They even come in taper candles. to order some of your own. 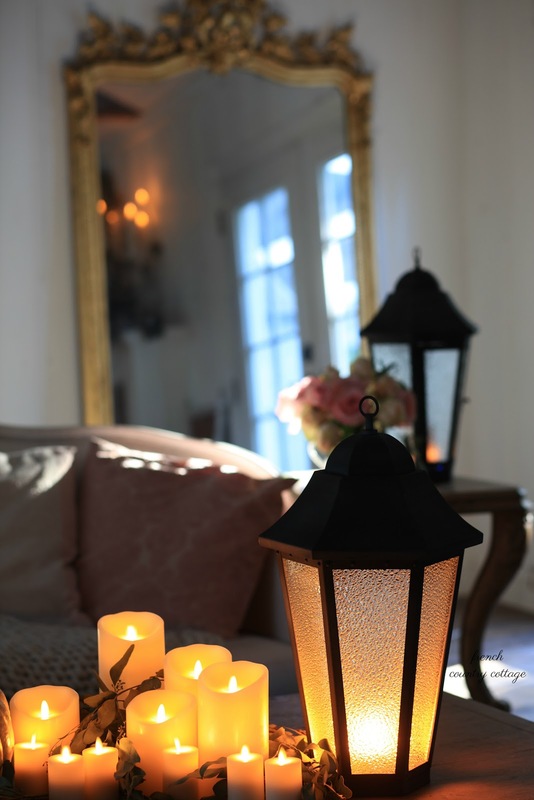 I styled 2 spaces to show you how these pieces could be easily incorporated into your home. 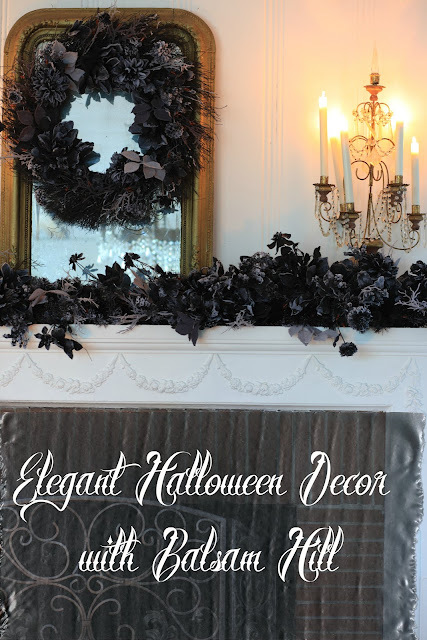 Because- hello beautiful elegant spooky mantel! I used just 3 things for each of these stylings. 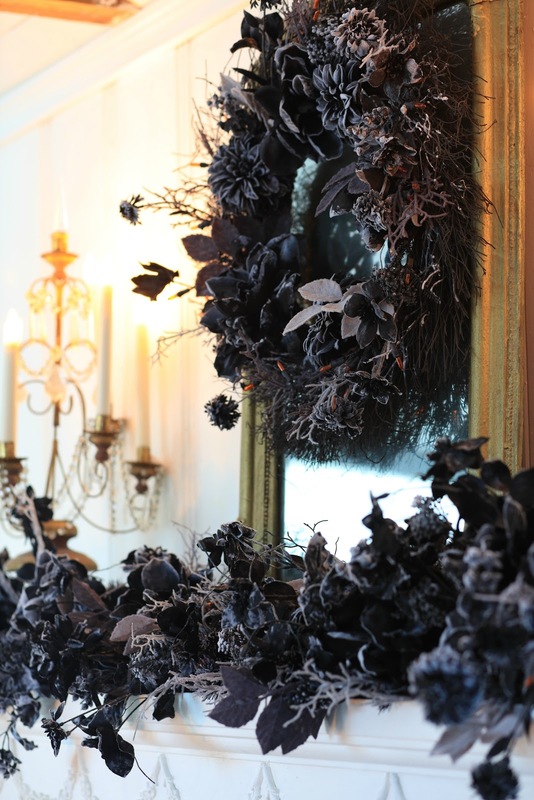 I am in love with this spooky elegant garland. 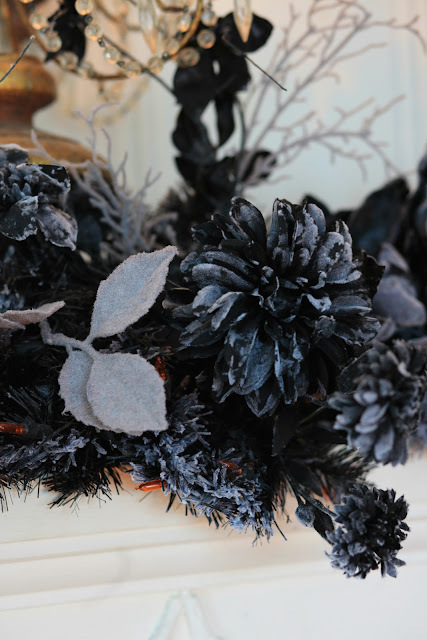 and leaves that makes it feel like it is frozen on Halloween night. 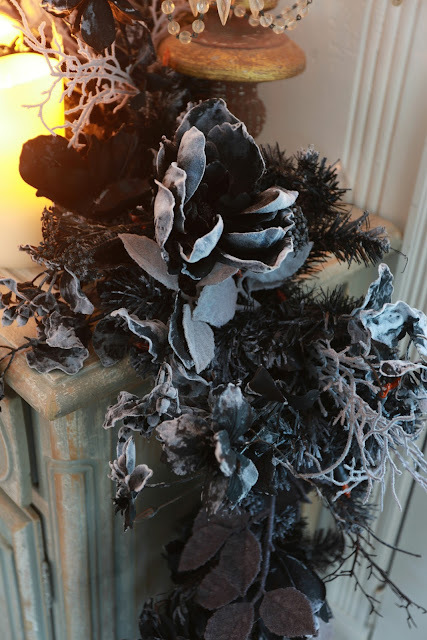 The dahlias and magnolias and frosted branches are stunning in person. 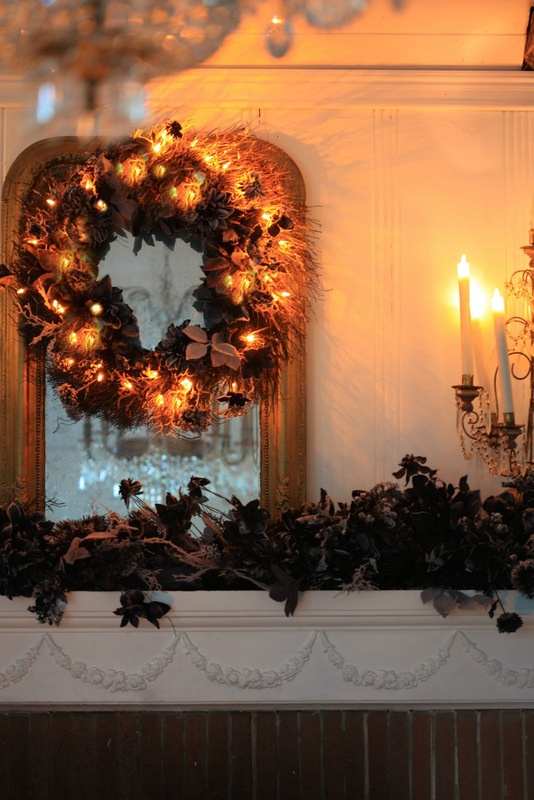 And both the garland and wreath can be lit with batteries. 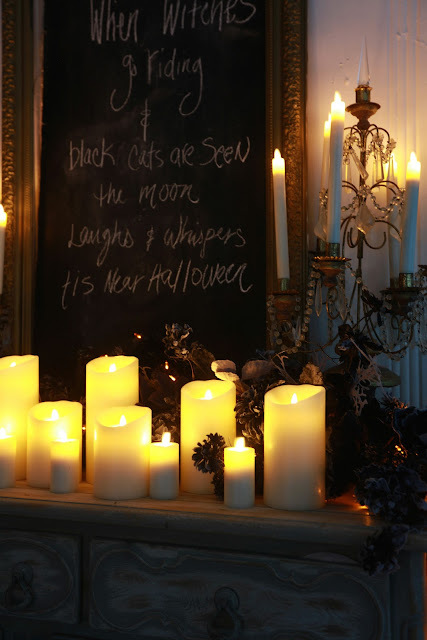 Which means that Halloween night takes on an even more spooky elegant look. And those lanterns completely knocked my socks off. and I absolutely love the flicker they create. 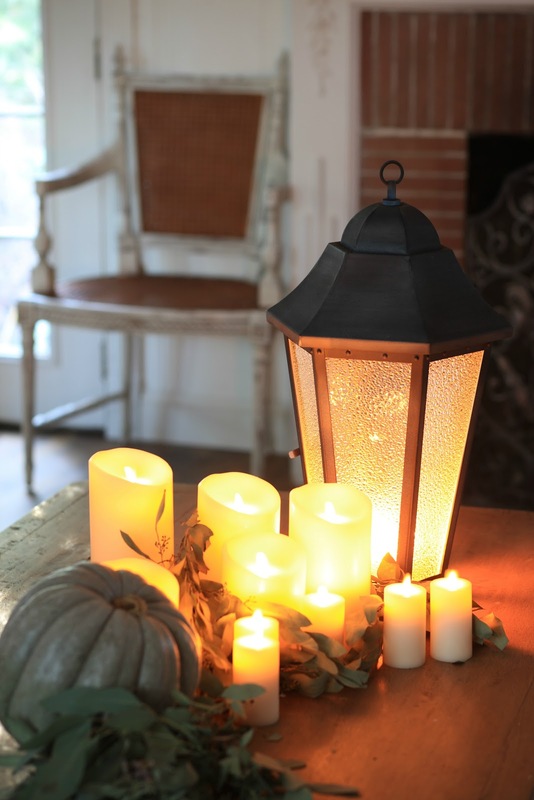 for ambiance by the fire. For a quick change different look- I styled a sideboard in the dining room. and all the decor that you would put there- is a sideboard. This sideboard currently has that old chalkboard I made years ago sitting on it. So I switched the saying to be a bit more spooky and then got to work. loaded the sideboard up with candles. 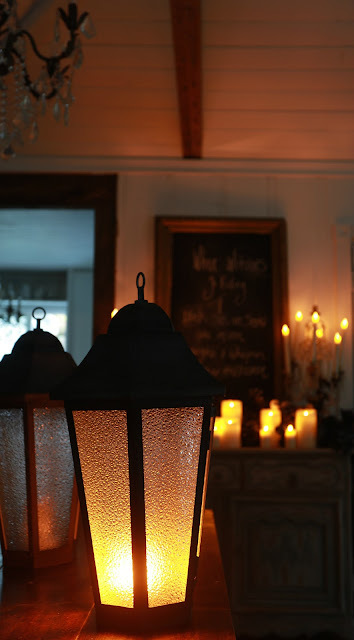 Serious love for the ambiance they create in this little corner. And over here I lit the garland instead of the wreath to show what that looks like. 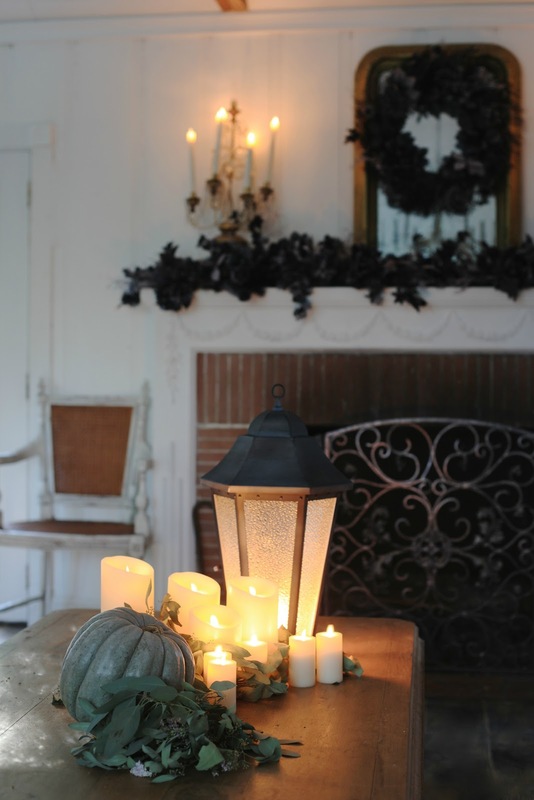 I love the warmth that the orange bulbs create. Those flickering lanterns landed on the table for a bit of tabletop ambiance. Not sure what my favorite thing is with these elements- they are all so charming. that shows just how versatile these pieces can be. 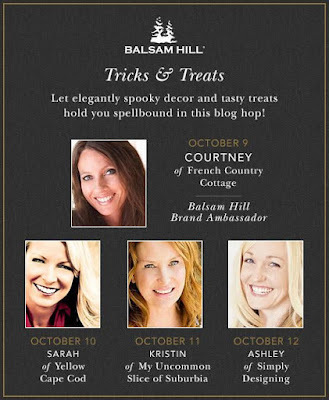 And you won't want to miss any of the gorgeous 'spooky' stylings these ladies are sharing. 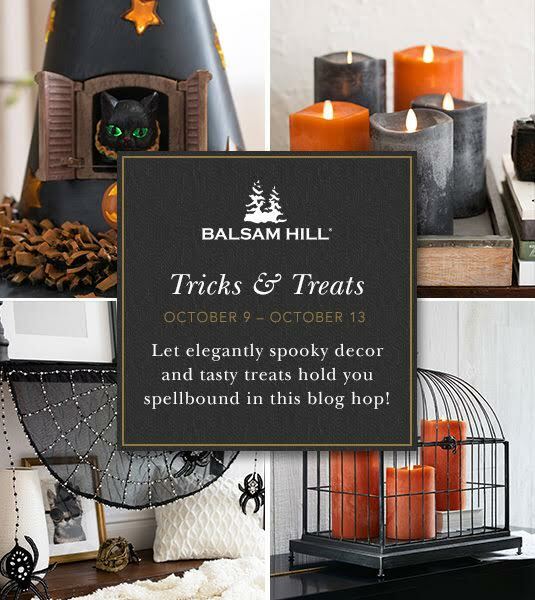 Love these spooky ideas! Really gets me in the Halloween spirit!! 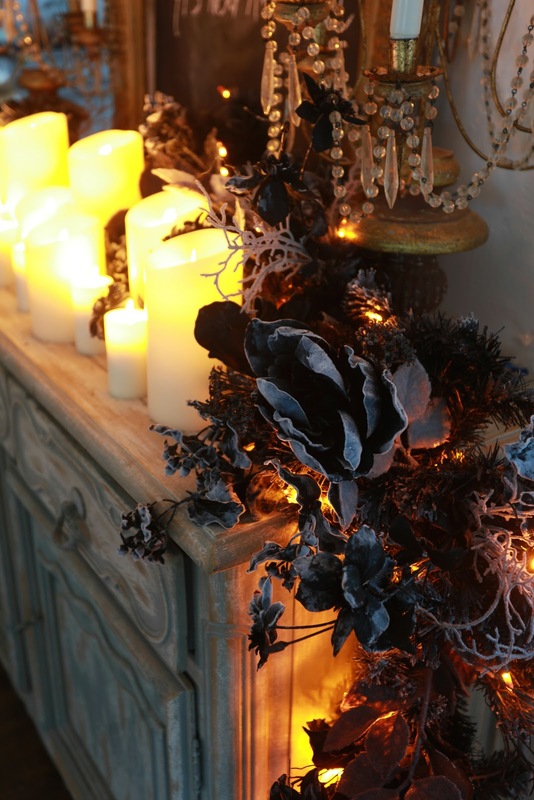 I've never been much into Halloween either, but this elegant spooky is a great twist to the usual creepy. Love it! Did you ever watch Practical Magic...your beautiful, romantic photos reminded me of the candles lined up on the mantel in the movie - very beautiful! I love how elegant and soft your Halloween decor is Courtney, and the tapers are fabulous!! 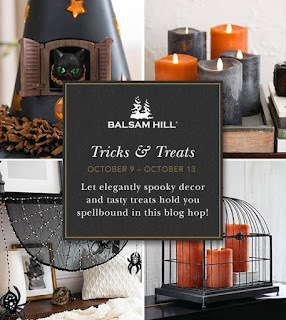 I must say that the Balsam Hill flickering candles are my favorite thing to use in both every day decor and seasonal decor...love those tapers...your mantels are so very spooktacular! I can see why those lanterns knocked your socks off! Now were they of the orange and black style with the turned up toes? 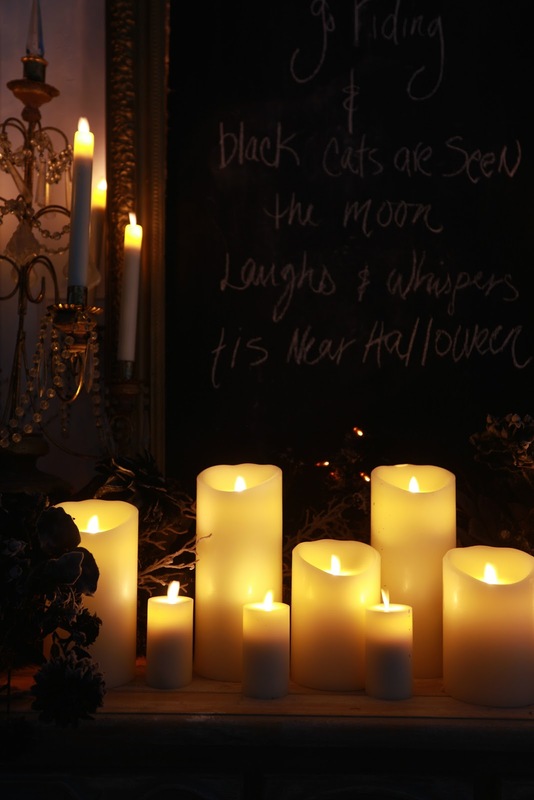 I adore these candles they are amazing and the perfect fix for a balmy afternoon and evening. 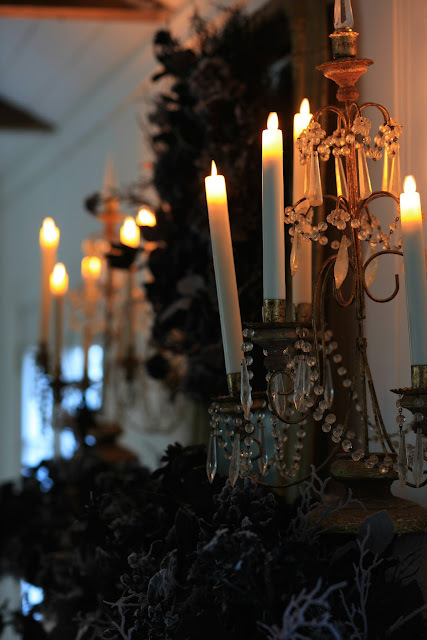 Your vignettes are gorgeous! Have an amazing day! Love all the Halloween Decorations!